www.VIGILANCEVOICE.com "Don't Forget, I Died Saving You!" GROUND ZERO Plus 39, Oct. 20, New York City— believe his name was Hector. I was more interested in his emotions, than his name. I watched his eyes get wet as he talked about his friend Danny, smashed under the rubble next to him after the World Trade Center collapsed on them-- three Port Authority Police Department officers helping to save people. I felt the power of the Sentinels of Vigilance in Hector’s reflections of that moment, that day. He was remembering a friend, a comrade, a buddy, a pal, a fellow warrior, lying in the rubble, counting the minutes until his death. He was telling the world not to forget he died to save his buddies. Hector was telling the world Danny didn’t want to be forgotten—that he wanted to be remembered as the guy who died saving others. I liked that story a lot. It meant Danny knew people want to forget. They don’t want to remember people dying. But Danny, in his last dying breaths, didn’t want that to happen. He didn’t want to die in vainglorious memory, his reason for death atrophying in the minds of those he died for. I saw the interview on 60 Minutes, and again on MSNBC. It was the same both times. Hector told how the building collapsed and how he and the two other Port Authority Policemen were trapped for hours under the debris. They lay in the rubble, one dying, the others thinking they would. Until a Voice was heard. “The U.S. Marines are here. Is any body down there?” Then Hector began to bang on a pipe, and the rescue was effected for two of them. But it was too late for Danny. Hector’s story is important because it reminds me to not become complacent, to not forget why Danny and thousands of others died on the Second Tuesday of September. I know how easy it is to forget a tragic death of one, or many. Fifty thousand of my buddies in Vietnam are gone. I want to forget about their deaths. I always feel “creepy” when I walk along The Wall. I feel a 100,000 eyes looking at me, wishing they could change places with me. I feel creepy about The Wall because if forces me to remember a million Vietnamese died over the length of the Vietnam War. While I consider it disrespectful to turn my head to death, or my small part in the destruction of so many for so little, part of me wants to pretend it didn’t happen, to accept no personal responsibility. I often want to dismiss Vietnam as a “tragic event,” one better washed from my soul than hanging around haunting it with guilt and shame. But I have trouble erasing the faces of the Terrorized children, or the villagers glaring emptily at me as we marched through the rubble. I am told it’s natural to want to bury the dead and get on with living. We want “closure,” as though we could heal the wounds of death by turning our minds, our feelings, our attention away from those who have “passed on”-- reverently believing, or wanting to believe, that they have gone to a “better place.” I like to think that about all my friends who are no longer on this earth. But Danny didn’t want that. No. He refused the idea of dying even as he died. He knew people would want to forget his death because they wanted to forget the tragic circumstances surrounding it. Just as I don’t want to think of the million dead Vietnamese because of the tragic circumstances that surrounded the war. Danny knew that avoiding answering the reason why he died was a form of Complacency. Unless there was a good reason for his death, something dramatic, his memory might die over time. So he gave Hector a reason to remember him: “Remember, I died trying to save you…” He put a reason behind his death. He gave death life. I have given Danny life too. I believe he’s a Sentinel of Vigilance. And he’s wearing a Semper Vigilantes armband. But I know many of us want to bury the tragic memories of that day. We want to nail shut the five-thousand coffins and get back to “normal.” We want this “Terrorist incident” to disappear just as soon as we have dropped our last bomb, or hanged the last Terrorist responsible for the attack. We think we will be happy and satisfied Terrorism has been stopped when we have avenged ourselves with the blood of our enemy. Part of me wants to forget September 11 ever happened, or that I was there at Ground Zero as buildings collapsed all around me and others died so I could live. I shoved Vietnam out of my mind, as I have most tragedies that threatened my internal security. I’d prefer they not pop up and terrorize me with their faces, or memories, or all the pain and problems they caused me. I want to turn a blind eye to them. I hear Danny’s words too. I’ve adopted them. While I can never know the force with which they were planted in Hector’s soul, I can relate. In Vietnam I held a buddy in my arms who had been mortally wounded by a Claymore mine. I rocked him as he bled to death from the wound that severed his throat. In his last breath he clutched my jungle utilities, gazed at me with eyes slowly losing their life’s light, and gurgled the words, “Why Me? Why Not You?” Then he died. I never thought much about those words until recently. Now I know what he was saying. He died for me. As Danny did, and the thousands of others who perished that day at the hands of Terrorism. I believe Danny was telling Hector more than just to remember him as the guy who died to save his life. I believe Danny was telling Hector he was en route to become a Spartan of Vigilance. In that last breath before life was squeezed out of him, I believe Danny was telling his buddy that he would rise again, not in a mere religious or spiritual context, but as a Sentinel of Vigilance. After all, Danny was a cop. He was trained to support, defend, and protect the innocent from the evil, the good from the bad, the corrupt from the unsuspecting. Why not see Danny standing over the ashes of the World Trade Center, a wreath in one hand representing the Peace he strives to achieve with Vigilance, and, his hand on the hilt of a sword ready at his side? Why not see Danny ready to drive back the Terrorists when and if they come again to threaten the security of America? I see Danny in lots of ways. I see Danny looking three-hundred and sixty degrees, out over the horizon, to people who may believe that once America’s belly has been slashed with Terrorism, they too can take a whack at us---they too can claim Holy War against the West’s most powerful nation by threatening its children’s safety and security. I also see Danny looking inside our country, to all points of the internal compass. He is watchful that no one abuses the freedom of the children under the guise of government—or unnecessarily steals from the children certain rights that might terrorize their future freedom. I see Danny sitting by a child’s bedside, soothing his or her worried soul about the anthrax scares, telling the child that he is protecting him or her-- guarding, watching as policemen do, so that no or little harm can befall the child or the family and loved ones. 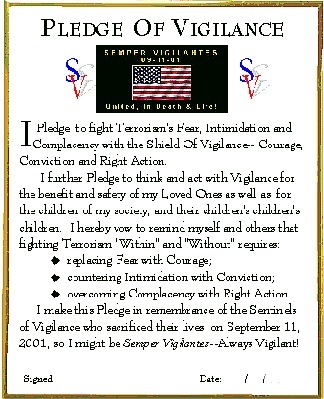 I see Danny urging the child’s parents to become Parents Of Vigilance so the child will know the importance of building courage, conviction and action into his or her life so they can ward off any future attack by other Terrorists trying to feed on fear, intimidation and complacency. I see Danny urging the child’s parents to work together with other families to find ways to protect their children. I see him organizing the community to build a Shield of Vigilance that can respond to any and all threats from either inside or outside this nation. I see Danny talking to the local religious leader, encouraging him or her to preach the message of Vigilance, so that the members of the religion understand that God does not take a single soul without a reason—even if we don’t understand or accept that reason—and that those who died under Terrorism’s dark hand, died to protect them, died to remind them to not become complacent. I see Danny rubbing the stomach of a pregnant woman, telling the unborn child that he is there not only to protect the children who have been born, but the unborn, the children of the children's children. And that he will stand vigilant for them, as he has their brothers and sisters, their parents, uncles, aunts, cousins, nephews and nieces. I see Danny telling newspaper publishers to allocate a small space on their masthead, or front page, to speak to the children, to remind them of Vigilance so readers traveling through the horror of the day’s terror-ridden news, will see a bright light of Hope shining through.